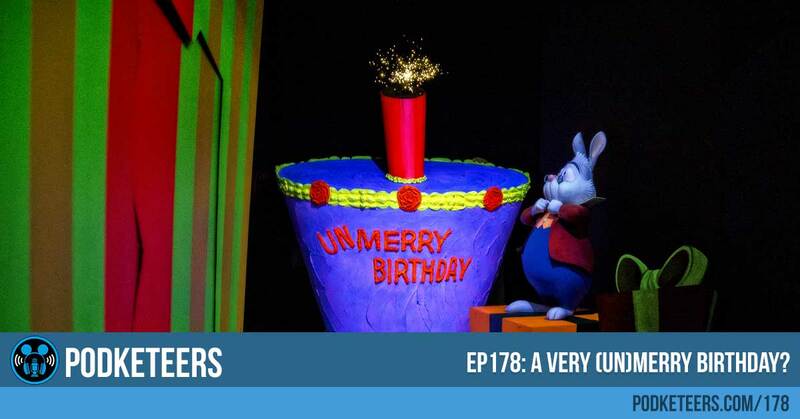 Ep178: A Very (Un)Merry Birthday? W e were very excited to have Erick from Trader Sam’s Coffee Company on the podcast this week! Trader Sam’s Coffee Company started off as Smiling Dog Coffee in 2014 but two years later Erick and his wife took their love for Disney and channeled it towards making premium flavored coffees. They re-branded as Trader Sam’s Coffee Company and launched with their ‘Skipper’s Brew’ a “Jungle Banana Pie” flavor. Disney fans may notice the Jungle Cruise-like theme and that is because that is their favorite attraction. of the They also have guest artists create great pieces of art that are used as labels on their different flavors. 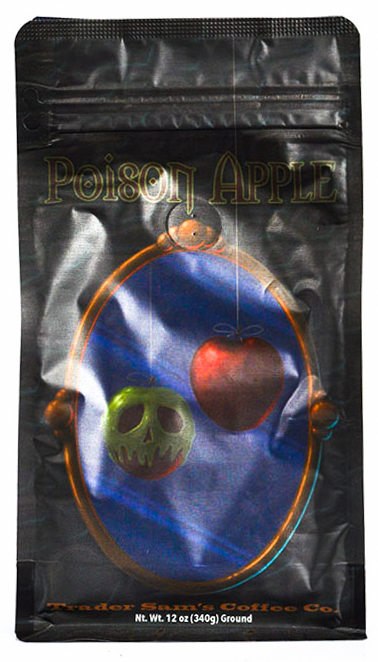 Two labels designed by our good buddy Gavin Otteson were for the flavors ‘Happily Never After’ and ‘Poison Apple’ (and in case you were wondering, this is a baked apple and cinnamon flavor) and we hear that rumbles that he’s working on another secret project with Trader Sam’s Coffee Company. 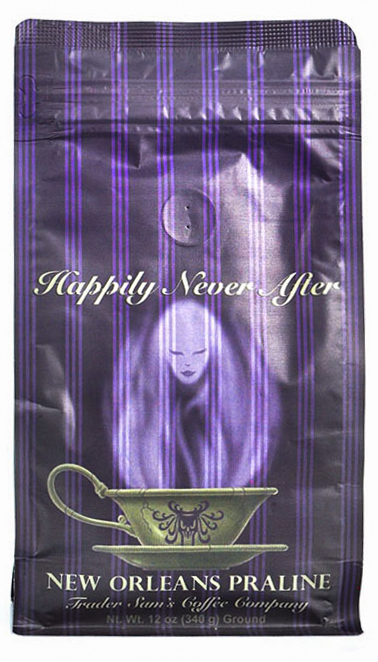 Several months ago we purchased ‘Happily Never After’ (a vanilla praline flavor) and ‘Bobsledder’s Brew’ (a fudge brownie flavor) both of which are still available for order. Along with those we tried two additional flavors that have been since discontinued which were their ‘Plus Ultra Vanilla’ (a smooth vanilla flavor without the sharp chemical aftertaste that other vanilla flavored coffees have) and their ‘Creativity Blend’ (a salted caramel flavor that was very well balanced). I’ll start by saying that I’m the biggest coffee drinker in the family and I generally drink my coffee black. For the most part I no longer drink coffee to “wake up” I just enjoy the flavor especially when made through a french press (or similar means) that really help extract the flavors. While most don’t like their coffee black, I’ve learned to love the (sometimes) subtle nuances of roasts from different regions. Javier, on the other hand, is not a big coffee drinker because he doesn’t like the bitterness of it but he truly enjoyed sampling ‘Happily Never After’ and ‘Bobsledder’s Brew’ (which was his favorite of the two). When it comes to the flavors of these themed coffee’s there is nothing subtle about them. The folks at Traders Sam’s Coffee Company have done a remarkable job of packing bold themed flavor while not sacrificing a richness of the coffee beans they use. They’ve also done a great job of finding an ideal roasting point for their coffee beans resulting in coffee with very low acidity giving you a very smooth drink. I tend to drink my coffee black because I’m always afraid that adding something will ruin the taste that the coffee was intended to have by the roaster. If I add something to my coffee (like creamer, milk, etc) it is either because I’ve been drinking a lot throughout the day and need to scale down or the coffee is not very good and I’m trying to mask the flavor (and am in a situation where I don’t have another option). On that note, one suggestion I can offer is if you choose to use a reusable K-Cup with this coffee, make sure you turn your Keurig machine to the lower temperature setting (if it allows such setting) in order to not burn your coffee as you’re brewing it. Also, since our last order, Trader Sam’s Coffee Company has switched from the traditional brown coffee bag with the bendable tin ties to a barrier pouch with an airtight resealable top to help with the freshness of the coffee which is a great choice especially if you buy several flavors and open them all to try. Each flavor (that we’ve tried so far) is definitely as intended and you can tell that a lot of care has been has been placed on providing an aromatic and flavorful experience with each cup that you brew. When breaking down a flavor like ‘Happily Never After’ where you can taste the nuttiness of the praline but the vanilla is equally strong. The ‘Bobsledder’s Brew’ that we had tasted as if a brownie liquefied in our mouth. Overall, we would recommend this coffee as your morning wake-me-up or an afternoon pick-me-up! Trader Sam's Coffee Company is offering our listeners a 20% discount off your first order! Just use discount code POD20 during checkout. Click the button below to check out their website! If you’re a fan of Dapper Day you might be excited about the kick-off of a new series of night events at the Disneyland Resort. 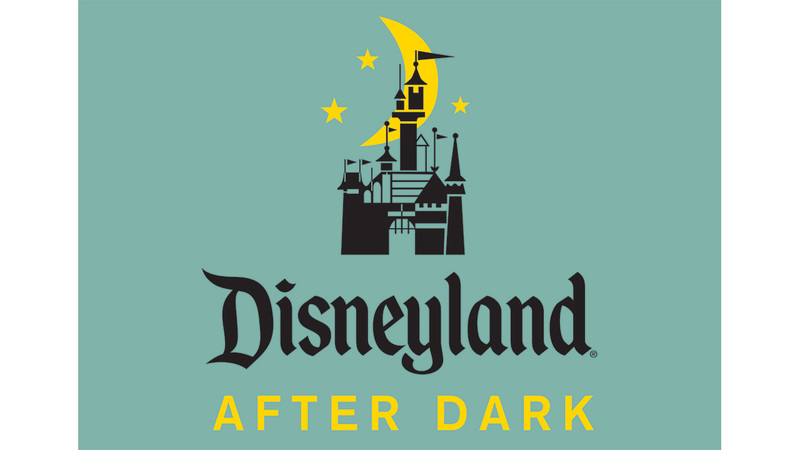 Disneyland After Dark will be a series of after hours experiences starting January 18th which will kick off with a “Throwback Night”. When news first broke on this many were upset feeling Disneyland was now “charging for Dapper Day”. This is, indeed, a ticketed event similar to how Mickey’s Halloween Party requires a separate ticket for entry but one thing that we didn’t make clear in the episode is that this is a one time event as part of a series of different events that are coming to the resort. From the looks of it, Disneyland is not “taking over” Dapper Day or “charging for it” it’s simply an event that just happens to be themed to the early years of the park (50’s and 60). The event will feature live music and dancing and will feature an exclusive showing of Fantasy In the Sky. Tickets will go on sale for this event on November 20, 2017 to Annual Passholders and on December 7, 2017 for the general public. Do you think you’ll be going to this event? Tell us your thoughts down below! Big thanks goes out to our special guest co-host (our friend and Fairy Godparent), Melissa! Make sure to show her some love by checking out her Etsy shop and following her on social media!